and off-road vehicles (ORVs) such as 4x4s. 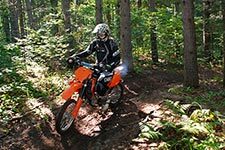 There are 54 state and grant-in-aid trails for you to ride, thanks to club volunteers and the DNR—or you can find some great riding in Minnesota state forests! Temporary closures may happen due to weather, special events, logging and road work. Find updated rules and regulations in the OHV Regulation Booklet. All OHVs must be registered or a non-resident must purchase a non-resident trail pass to ride on state or grant-in-aid trails. 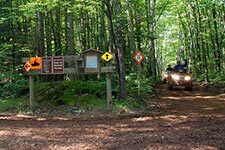 OHVs are generally permitted on state forest roads and trails in accordance with state forest motor vehicle use classifications and regulations. Safety training is recommended for everyone that operates an OHV. 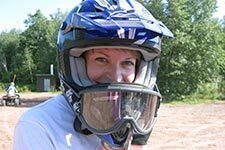 It is required for ATV riders born after July 1, 1987 and OHM riders under the age of 16.